This article is about Shulk's appearance in Super Smash Bros. 4. For the character in other contexts, see Shulk. Shulk (シュルク, Shulk) is a playable character in Super Smash Bros. 4. After initially being leaked on August 19th, 2014 as part of the ESRB leak, Shulk was officially revealed in a Director's Room Miiverse post on August 29th, 2014, which coincided with the announcement of Xenoblade Chronicles 3D on the same day. Adam Howden and Shintarō Asanuma reprise their roles as Shulk's voice actors in the English and Japanese versions of SSB4, respectively. Shulk is currently ranked 35th out of 55 on the SSB4 tier list, placing him in the D tier. Thanks to the Monado, Shulk possesses a number of worthwhile strengths, most notably the Monado Arts. The Arts are extremely versatile, as they enable him to temporarily alter his attributes and thus adopt a variety of playstyles that can, with optimal usage, quickly enable him to regain the advantage. The Monado itself possesses the longest overall range of any weapon in the game, which in turn gives Shulk one of the most effective movesets for spacing relative to the rest of the cast. Lastly, Vision is one of the most effective counterattacks in the game, thanks to it boasting high power, impressive range, and one of the longest counterattack windows of its kind. However, Shulk's main weakness is his sluggish overall frame data. This is most obvious with his aerials, which have extremely high ending lag and, with the exception of forward aerial, are completely unable to auto-cancel in spite of their interruptibility. When coupled with his tall frame and heavy weight, Shulk's problematic frame data also makes him vulnerable to combos and juggling. Although it is excellent, Shulk's range nevertheless has its flaws: his heavy reliance on aerials makes him prone to out of shield attacks, his smash attacks are completely unsafe on shield without Buster, and most of the Monado's sweetspots are located close to him. Lastly, the Monado Arts require precise usage because of their respective strengths and weaknesses, as well as their cooldown duration. This is further compounded by the Arts' advanced techniques requiring extreme frame precision. Due to these factors, Shulk's representation and results at high-level play have been below-average throughout Smash 4's lifespan. Despite this, Shulk has a dedicated playerbase that have gradually discovered unique Monado Art set-ups and technical combos, allowing his placings at regional tournaments to gradually improve and become more consistent; several dedicated mains have even managed to earn noteworthy results at national tournaments, such as Nicko and Kome both managing to place 17th at Frame Perfect Series 2 and 33rd at 2GGC: Civil War. Shulk is a heavyweight, being the third heaviest swordsman in the game. However, his attributes are somewhat atypical for his weight class: his walking speed, falling speed and gravity are average, his dashing speed is slightly below-average, his air speed is above-average, and his air acceleration is below-average. Thanks to these attributes, Shulk has relatively good mobility for a heavyweight, especially in the air, although they do not grant him too many obvious advantages or disadvantages. 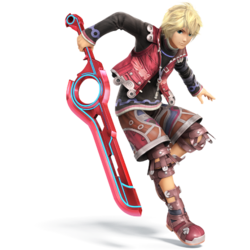 Shulk's greatest strength is his disjointed range: thanks to the Monado, Shulk possesses the longest overall disjointed range in the game. Shulk's excellent range allows him to punish careless moves by retaliating at a distance, or create space by challenging his opponent with his disjointed attacks. His most useful grounded moves are his neutral attack, up tilt and smash attacks, each of which possess distinct perks. When clean, his neutral attack is the most damaging non-infinite neutral attack in the game by default. His up tilt boasts outstanding vertical range, can cover multiple get-up options from the edge, and can KO at very high percentages. Lastly, his smash attacks boast high power and long ranges; his forward smash, in particular, is the third longest ranged forward smash in the game, being surpassed only by Corrin and Mii Gunner's. Shulk also boasts a powerful aerial moveset, which plays a key role in his approach and spacing games. Both his neutral and forward aerials possess wide-arced ranges with low landing lag, making them Shulk's best approach options. The former is useful for anything from starting combos to covering landing options thanks to its long-lasting hitbox and low landing lag, while the latter's wide range and dependable speed makes it a very good edge-guarding and spacing option. His back aerial is a capable KOing option due to it being Shulk's most powerful aerial, with its high horizontal range also allowing it to space or poke from a distance. Lastly, his up and down aerials are, like his back aerial, thrusts instead of slashes. As such, they have minimal horizontal ranges, but can KO surprisingly early should they hit, with the former being potent near the upper blast line, whereas the latter is capable of meteor smashing. Much like in his home game, Shulk is a character who revolves around adapting to different situations with his attribute-enhancing Monado Arts. Each Art tweaks his attributes considerably for 16 seconds and can be manually canceled at any time, even immediately after hitstun ends or during landing lag. With this freedom, Shulk can activate an Art to open up options for virtually any situation while still being able to switch or cancel them if he is in a challenging position. Jump grants him significant aerial mobility by making his jumps the highest in the game while improving both his air speed and Air Slash's height. This allows him to recover from almost anywhere off-stage, edge-guard more aggressively and even perform several KO combos, such as a wall of pain leading to a sacrificial Air Slash at medium percentages. Speed amplifies his usually average ground speed while reducing his jump height, making his ground-to-air transitions more efficient for aerial combos and spacing, while allowing him to approach and retreat noncommittally. It also lowers traction, making Shulk's pivot grab the third longest in the game (tied with Meta Knight) for its duration. These two Arts grant him outstanding mobility for a heavyweight, and when combined with the large hitboxes of his attacks, Shulk can effectively space opponents out of a specific side of the stage with either Jump or Speed, making him very difficult to approach on stages with platforms. Shield bolsters Shulk's defensive game by reducing both damage and knockback received, which allows him to survive for a much longer period of time and resist getting trapped in combos. His shield also becomes much more durable, making it harder to break with shield-breaking attacks such as Bowser Bomb. Buster reduces his overall knockback, but increases his overall damage output, allowing him to rack up damage extremely quickly. Buster also makes up and down throws effective and damaging combo starters at 0%, while the increased damage and shieldstun make Shulk's moves both safer on shield and capable of pressuring shields. Lastly, Smash boosts his entire moveset's knockback, making almost all of Shulk's attacks KOing options (especially with rage), and his down throw becomes the strongest in the game while it is active. Thanks to the Monado Arts, Shulk is highly adaptive, and usually has an easier time mixing up his playstyle compared to other characters so long as his Arts are used effectively and in tandem with his powerful air game. Such an example would be constantly switching from Jump and Shield to stall a losing match, or activating different arts while being juggled to affect Shulk's falling speed, and hence mess up an opponent's combo. Lastly, his heavy weight allows him to use rage effectively, especially when combined with Shield in order to survive and accumulate rage, or with Smash for a risky, yet powerful boost in knockback. Due to the technical aspects of activating Monado Arts, Shulk also has access to multiple unique advanced techniques, the most notable of which is known as Monado Art Landing Lag Canceling. By jumping and timing the activation of an Art just before landing, Shulk can reduce the landing lag of his aerials to 5 frames while gaining intangibility for 14 frames (1 frame less than the length granted by his sidestep). While difficult to perform, it allows Shulk to avoid punishment before immediately responding with a punish of his own, or start shield break combos, such as an Art canceled back aerial to forward smash. It can even let him retreat by pivoting in midair, or extend the invincibility of air dodging via an aerial Art activation. This technique is the only viable way to make some of Shulk's moves (such as back aerial) safe on shield against faster characters. Several other techniques include the Monado Purge, a 50/50 KO set-up consisting of an up throw to up aerial at high percentages, and Monado Art Edge Snapping, which bypasses edge get-up animations while protecting the user with brief intangibility. When mastered, Shulk's Monado Art techniques can be very effective and unpredictable mix-up options that are inaccessible by any other character. Excluding his Arts, Shulk's special moveset shares his overall high range, and all have their own forms of utility. Back Slash is very powerful when striking the opponent's back and has long range regardless, making it a great surprise attack as well as a decent spacing tool. Air Slash grants a good amount of vertical distance, comes out quickly, and has strong knockback growth, making it a good recovery move and an even better out of shield option. The distance and knockback of Air Slash can additionally be affected by the Jump and Smash Arts respectively, allowing the move to gain even more vertical distance, or be used as a combo finisher in the air or a KO option out-of-shield. Lastly, Vision is tied with Double Team for having the longest lasting counterattack window in the game when fresh while also having the longest range, both of which give Shulk one of the most effective counters of any character. Its alternate counterattack, which is performed when Shulk inputs the direction from which the triggered attack came from, also rivals Counter Surge as the strongest counterattack in the game. However, Shulk has some glaringly exploitable weaknesses. Despite his outstanding range, his moveset is infamously sluggish to compensate, being among the slowest in the game along with King Dedede and Ganondorf's. Aside from his neutral attack, standing grab and Vision, the remainder of his attacks do not hit before frame 9, while only his down tilt has less than 25 frames of ending lag. Like the aforementioned heavyweights, this means he has to rely on careful reads to land a hit, as a missed attack can easily be capitalized upon. This is made worse by the low shieldstun of his attacks (unless Buster is active), making his attacks inherently unsafe up close and on shield, while still unsafe if spaced against faster characters prevalent in the metagame. Additionally, despite his excellent range, most of Shulk's moves deal more damage with the Monado's blade rather than its beam blade, while several of his strongest combos (such as a landing neutral aerial to a grab or a forward aerial wall of pain) rely on him being extremely close to his opponent/affected by rage to be inescapable, due to his beam blade's lower hitstun. As a result, Shulk is sometimes required to take risks before he can start performing any significant combos. His sluggish frame data also extends to his aerials. While he is uniquely the only character who can interrupt the ending lag of his aerials with a jump, air dodge or another air attack, all of Shulk's aerials have disproportionately high ending lag, with neutral aerial in particular having 40 frames of ending lag. In addition, Shulk is the only character who cannot auto-cancel any of his aerials, forcing him to endure landing lag every time he starts an aerial attack, even from a double jump (with the exception of forward aerial). While Monado Art Landing Lag Canceling can negate this, it is considerably more complicated to perform compared to auto-canceling, making it very difficult and unwieldy to perform consistently. Essentially, this makes every attack very committal, and makes it important for Shulk to space his attacks carefully as he can easily be punished for missing. Additionally, moves such as back aerial or up aerial are unsafe to use upon landing; unlike many other characters' aerials, their hitboxes only appear after a pause, making it possible to land before an attack even comes out while causing Shulk to suffer from landing lag. Due to his weight and stature, Shulk is an easy target for combos and juggles, as his tall height, slow air acceleration, and lack of quick combo breakers (with his fastest aerial, neutral aerial, hitting on frame 13 and beginning behind himself) makes it difficult to break out of combos. His lack of a projectile and anti-projectile options also makes it difficult to pressure his opponent from a distance, while making it hard for him to approach against projectile users as well. Even pressure on the ground can be hard to escape from, as Shulk has the fifth lowest traction in the game. This gives him a poor out of shield game without Air Slash, which is punishable when missed. Shulk's special attacks are also flawed in some ways. Back Slash's knockback is exceptionally weak if hitting the opponent's front, has considerable ending lag, and is notorious for its inability to edge sweetspot. Air Slash provides very little horizontal momentum and does not sweetspot edges immediately unless the second slash is inputted right beside an edge, thus making his recovery predictable, even with Jump. Lastly, Vision's counter window decays upon consecutive use, which discourages frequent usage. The Monado Arts also have debuffs to compensate for their buffs: if an Art is active, it causes some of his other attributes to drop, weakening some of his abilities. A careful opponent can potentially take advantage of them to gain the upper hand, making his Arts a double-edged sword due to his reliance on them to approach and/or perform combos. Jump makes him very vulnerable to damage, and when combined with his slow moveset, makes it even riskier to whiff a move. Speed lowers his damage output, requiring him to deal more hits for the same amount of damage and reduces his jump force to the point of hindering his vertical mobility. Shield drastically reduces his mobility and damage output to the point of making his recovery and offensive potential among the worst in the game. When coupled with his worsened mobility, Shield's increased knockback defense also leaves Shulk heavily susceptible to combos and juggling. Buster increases his vulnerability to damage, albeit not to degree of Jump, while its lower knockback drastically lowers Shulk's KO potential to the point that his smash attacks will not KO until past 150%. Finally, Smash drastically lowers his endurance, hinders his combo game, and makes his attacks the least damaging in the game. Even having no Arts active is disadvantageous, as Shulk's balanced attributes do not allow him to easily approach or catch up with opponents. Having no Arts active also hinders him offensively: very few of Shulk's moves possess combo potential past low percentages, and all his smash attacks are punishable because of their high ending lag. This forces Shulk to be reliant on edge-guarding and spacing while waiting for an Art to refresh, and requires him to capitalize on the duration of a needed Art to the fullest in order to perform certain techniques (such as combo strings or approaching), compared to other characters who may have the ability to do so at any time. Shulk's custom moves grant him various options. Decisive Monado Arts last longer and have amplified effects, but cannot be changed. This makes them great for regaining neutral or claiming stage control, but at the cost of their dynamic flexibility in the middle of the match. Hyper Monado Arts last much shorter and with even harsher debuffs, but their buffs are even more powerful, which allows him to briefly boost a needed stat to the extreme and capitalize upon its benefits in a much shorter time. Back Slash Leap offers quicker start-up and more vertical range, at the cost of some horizontal range and more ending lag. Advancing Air Slash gives more horizontal distance and the second hit is stronger, but it gives less vertical distance. Mighty Air Slash is more powerful, but has only half the range, making it difficult to connect the second hit. Dash Vision is weaker than normal, but it has much more range, is much faster upon activation, and gives Shulk both his only anti-projectile option and another recovery option. Lastly, Power Vision has much more start-up upon counterattacking and a much stricter counter window if used repeatedly, but the counterattack itself is immensely powerful and capable of scoring one-hit KOs even if used against very weak moves, especially with Smash. Overall, Shulk's optimal playstyle consists of warding off pressure and having extensive knowledge of his opponent. While his weaknesses are exploitable when fighting head-on, his adaptability allows him to excel when played patiently and while exploiting openings. Regardless, Shulk has an extremely high learning curve because of a combination of uncommonly sluggish attacks and very demanding techniques, as extensive knowledge of Monado Arts, reads and patient play are each required for him to thrive. Shulk also has a notable playerbase that have discovered a number of signature advanced techniques and expanded his metagame, albeit to mixed results: his learning curve and weaknesses have resulted in him garnering low representation, while his results had been sparse until Nicko and Kome's tournament success as of early 2017. Shulk has been buffed significantly via game updates. Update 1.0.4 increased the damage outputs of almost every single one of his attacks; improved Speed and Buster by adjusting their damage output and input multipliers, respectively; and noticeably improved his down tilt and forward smash by adjusting their hitboxes. The changes to shield mechanics brought about by updates 1.1.0 and 1.1.1 were indirect buffs for Shulk: they made his attacks harder to punish on shield and turned several of his attacks into surprisingly effective shield breakers, especially when used with Buster. Lastly, update 1.1.3 increased the damage outputs of his dash, tilt and aerial attacks, as well as decreasing the landing lag of his aerials. As a result of these buffs, Shulk is considered to be much more viable than how he was during the initial release of SSB4. Neutral attack deals more damage: 3% → 3.5% (hit 1, hit 2), 4.3%/3.2% → 5.3%/4.2% (clean hit 3/late hit 3). All tilt attacks deal 1% more damage: 12%/10.5% → 13%/11.5% (forward), 7%/6% → 8%/7% (up), 8%/6% → 9%/7% (down). Forward tilt's knockback growth decreased: 100 → 92, slightly hindering its KO ability despite its increased damage. Down tilt's second hitbox's position has changed: bone 25, offset [0,2,-1] → bone 0, offset [0,5.5,5.5]. This removes the move's point blank blind spot. Dash attack deals 1% more damage: 10% → 11%. Dash attack's ending lag decreased: frame 57 → 53. Forward and up smash deal more damage: 5%, 12.5%/11% → 5.5%, 13%/11.5% (forward), 4%, 13% → 4.5%, 13.5% (up). Forward smash has been improved. It received a variety of changes to enable both of its hits to connect together better. Forward smash's first hit's angles altered: 40° (upward)/75° (forward)/84° (downward) → 78°/10°/40°. Forward smash's first hit's fixed knockback values decreased: 45/45/31 → 28/28/28. Forward smash's first hit's radii decreased: 4/4/4 → 2/2/4. Forward smash's first hit's positions elevated: [-2,0,1]/[4.1,0,1]/[10,0,1] → [11–4,0,2]/[11–4,0,-0.5]/[-2,0,1]. Forward smash's second hit's radii increased: 3.5/2 → 4/3. Forward smash's second hit's first hitbox X-offset decreased: 22–0 → 21–0. Down smash deals 1% more damage: 13%/10%, 11%/9%, 9%/7%, 7%/5%, 5%/3% → 14%/11%, 12%/10%, 10%/8%, 8%/6%, 6%/4%. All aerial attacks deal more damage: 6%/7% → 7%/8% (neutral), 6.5%/5% → 7.5%/6% (forward), 11%/7% → 12%/8% (back), 4%, 9%/6.5% → 5%, 10%/7.5% (up), 6%/4%, 10%/9% → 7%/5%, 11%/10% (down). Forward aerial's landing lag decreased: 21 → 18 frames. All throws' first hits deal 1% more damage: 2% → 3%. Monado Speed's damage output multiplier increased for all variations: 0.72x (default, Decisive)/0.576x (Hyper) → 0.8x/0.64x. Monado Buster's damage input multiplier decreased for all variations: 1.2x (default, Decisive)/1.44x (Hyper) → 1.13x/1.356x. All variations of Air Slash deal 1% more damage on the first hit: 5%/4% → 6%/5% (Air Slash, Advancing Air Slash), 8%/6% → 9%/7% (Mighty Air Slash). All variations of Vision have had their Y-offsets increased: 8 → 9. Back Slash's start-up lag decreased: frame 31 → 22. Aerial Back Slash travels slower. Up aerial's first hit now launches opponents at 96° and its second hit's hitbox sizes increased: 3.5u/5.5u → 3.8u/6.5u. These changes make its hits connect together better. Dash Vision's angle altered: 35° → 32°. Dash attack deals 0.5% more damage: 11% → 11.5%. All tilt attacks deal 0.5% more damage: 13%/11.5% → 13.5%/12% (forward), 8%/7% → 8.5%/7.5% (up), 9%/7% → 9.5%/7.5% (down). All aerial attacks deal more damage: 7%/8% → 7.5%/8.5% (neutral), 7.5%/6% → 8%/6.5% (forward), 12%/8% → 12.5%/8.5% (back), 5%, 10%/7.5% → 5.5%, 10.5%/8% (up), 5%/7%, 11%/10% → 6%/7.5%, 11.5%/10.5% (down). All aerials' landing lag decreased: 12 frames → 10 (neutral), 18 frames → 16 (forward), 21 frames → 19 (back), 17 frames → 15 (up), 25 frames → 23 (down). Shulk is the only character who can interrupt all of his aerial attacks before their ending auto-cancel frames. This means he cannot actually auto-cancel his aerials at all, but can avoid or reduce landing lag by double jumping or using another move before hitting the ground. However, his up and down aerials can be canceled by special moves after a full hop without any Arts, negating landing lag. By extension, Monado Arts can be selected during landing lag. 3.5% A jab, followed by a mid-level roundhouse kick, followed by an upward slash. Shulk's fastest move (hits on frame 5), has good range, and boasts the highest damage output of any non-infinite neutral attack in the game, so long as it is clean and neither Shield or Smash are active. These traits make it Shulk's most reliable damage racking option. Its second hit resembles Dive Sobat, one of Reyn's Physical Arts. 13.5% (blade), 12% (beam) An inward slash. Its impressive damage output and high knockback growth make it powerful for a tilt attack. While near the edge of Final Destination, its blade hitbox KOs middleweights at 119%/108% (3DS/Wii U). It is also capable of hitting opponents close to Shulk's back when pivoted, and deals high shield damage when Buster is active. However, its range is shorter than Shulk's other moves, while its narrow hitbox allows smaller characters to crouch under it. It is based on one of Shulk's basic Auto Attacks. 8.5% (blade), 7.5% (beam) An overhead arcing slash. It has a wide hitbox and excellent vertical range, almost being capable of reaching the top platform of Battlefield. As such, it is very useful as an anti-air attack, for covering most edge get-up options, challenging shields, or trapping landings while beneath platforms. With Buster active, it is also a useful damage racking option. Without Arts, it can also function as a situational KOing option, thanks to its high knockback growth; on Final Destination, the blade hitbox KOs middleweights at 153%/143% (3DS/Wii U). With the Smash Art, it is one of Shulk's strongest KO moves, doing so at around 105%. However, it only hits in front of Shulk at its beginning, and has moderate start-up and ending lag. 9.5% (blade), 7.5% (beam) A kneeling inward slash. Moderately slow for a tilt attack (hits on frame 10), but it has good range and the lowest amount of ending lag out of his entire moveset (21 frames). As a result, it is a good combo starter while Jump, Speed, or Buster are active. When spaced correctly, it is also able to hit edge-hanging opponents once their invincibility ends. 11.5% A braking inward slash. Unlike Shulk's other standard attacks, it does not possess a sweetspot or sourspot. When coupled with its decent damage output, it can function as a situational KOing option. While near the edge of Final Destination, it KOs middleweights at 156%/146% (3DS/Wii U). However, it has very high ending lag (37 frames). 5.5% (hit 1), 13% (hit 2 blade), 11.5% (hit 2 beam) A thrust, which causes the Monado to reveal its beam blade. It consists of two hits: the first is from the Monado's blade, which leads into the second hit from its beam blade. It is the third longest ranged, non-projectile forward smash in the game, surpassed only by Corrin and Mii Gunner's. When coupled with its ability to be angled, it can hit opponents attempting to grab the edge. The Buster Art grants the move good shield-pressuring potential. While near the edge of Final Destination, the non-angled blade KOs at 98%/84% (3DS/Wii U), while the non-angled beam blade KOs at 107%/97% (3DS/Wii U). However, the first hit's low priority makes it easily canceled by weak attacks, while the move's considerable ending lag (41 frames) make it very risky. It is also completely unsafe on shield. It is based on Slit Edge, one of Shulk's Physical Arts. 4.5% (hit 1), 13.5% (hit 2) Squats and slams the Monado's hilt onto the ground, causing its beam blade to thrust upward. An overall effective move for punishing, as the first hit's deceptive horizontal range launches opponents into the second hit, similarly to Marth and Lucina's up smashes. This allows it to punish rolls, landings, and edge get-up options. The second hit's vertical range, high knockback and transcendent priority allow it to KO reliably. Unlike forward smash, it does not possess a sweetspot and sourspot, which also gives it consistent KO potential. On Final Destination, the second hit KOs aerial middleweights at 99%/91% (3DS/Wii U). However, the first hit has considerable start-up (hits on frame 18) and ending lag (35 frames), making it equally as punishable. Opponents can also hinder its effectiveness by DIing downward to powershield the second hit after getting hit by the first, especially fast-fallers or if Shulk has high rage. 14% (hit 1 blade), 11% (hit 1 beam), 12% (hit 2 blade), 10% (hit 2 beam), 10% (hit 3 blade), 8% (hit 3 beam), 8% (hit 4 blade), 6% (hit 4 beam), 6% (hit 5 blade), 4% (hit 5 beam) Crouches and spins to swing the Monado in a circle along the ground. It is capable of hitting during any of its five hitboxes (three at Shulk's front and two at his back), with its first hit being strong enough to KO reliably. While near the edge of Final Destination, its first hit's blade hitbox KOs middleweights at 91%/81% (3DS/Wii U). Each spin quickly loses power, but the final spin has slightly more range. The Smash Art grants the later hits KO potential, despite their weak power without any Monado Arts. While it is possible for this attack to connect more than once, it is difficult to do so unless Buster is active and the opponent has low damage. With Buster active, it is capable of shield breaking if an opponent is cornered at an edge and the first three hits land. Extremely useful for punishing rolls and sidesteps thanks to its multiple hitboxes and range, but suffers from the most overall lag out of Shulk's smash attacks because of its considerable start-up (hits on frame 18) and ending lag (41 frames). It resembles War Swing, one of Reyn's Physical Arts. 7.5% (blade), 8.5% (beam) A circular slash around himself. It is one of Shulk's most useful approach options, thanks to its wide range, low landing lag (10 frames) and long duration. It is also his fastest aerial combo breaker, with a startup of 13 frames. Its hitbox begins slightly behind Shulk's toes and continues all the way over his head, allowing the initial frames to start combos if an opponent misses a tech and the later frames being able to punish air dodges; however, despite what the sword trail depicts, the move is unable to connect against enemies behind him during its final frames (when the Monado is parallel to the ground). A dependable combo starter while Jump, Speed or Buster are active, which can lead into a grab, neutral attack, forward tilt, up tilt, aerials or Air Slash. Its slow arc can also neutralize weak projectiles, such as those from Toon Link or Diddy Kong. However, its long-lasting hitbox and very high ending lag (40 frames) makes it a very unsafe move to use off-stage when fast falling, as Shulk will be in serious danger of self-destructing. 8% (blade), 6.5% (beam) A downward slash. It has the lowest amount of ending lag out of his aerials (24 frames), while its range grants it excellent coverage for an aerial, which makes it great for interrupting approaches and spacing. It is also a dependable combo option with either Speed or Buster active, and a powerful edge-guarding move with Jump active, which can allow Shulk to perform a wall of pain ending with Air Slash; this is a rage-specific damage/KO combo at certain percentages with Jump/Speed/Buster active, which has been dubbed the "Fair Slash" by players. However, it has noticeable landing lag, making it punishable on shield if spaced incorrectly. While the move is notably Shulk's only aerial that can autocancel, it is only capable of doing so immediately out of a jump without Arts (excluding Buster and Smash), giving it limited use. If it hits during its ending frames, which are near Shulk's feet, it will launch opponents behind him and allow for either Air Slash combos or a stage spike. 12.5% (blade), 8.5% (beam) A reverse gripped thrust. Its hitbox begins at Shulk's body. The Monado's blade deals respectable damage with high knockback growth, making it very useful for KOing. While near the edge of Final Destination, its blade hitbox KOs middleweights at 112%/101% (3DS/Wii U). Its high horizontal range makes it hard to challenge if spaced correctly or alongside Jump/Speed's aerial drift, making it very useful for long-range spacing. However, it has slow start-up and high landing lag, making it possible to land before the hitbox appears while suffering from full landing lag. Due to its long range, this move benefits the most from Monado Art Landing Lag Canceling, which also negates its usually high landing lag. 5.5% (hit 1), 10.5% (hit 2 blade), 8% (hit 2 beam) An upward thrust, which causes the Monado to reveal its beam blade. Functions like his forward and up smashes, with its first hit being from the Monado's blade and its second hit being from its beam blade. It has deceptively long vertical range that is capable of reaching through the main platform of Town and City, which makes it a useful juggling option against falling opponents and, when coupled with its second hit's high knockback growth, a strong KOing option near the upper blast line. On Final Destination and while near the upper blast line, its second hit's blade hitbox KOs middleweights at 94%/82% (3DS/Wii U). With Jump active, a landing up aerial can chain directly into another up aerial, leading to a KO combo. However, it has very minimal horizontal range and each hit only lasts 2 frames, which can make it difficult to connect with, especially if Shulk has too much momentum. 7.5% (hit 1 grounded), 6% (hit 1 aerial), 11.5% (hit 2 blade), 10.5% (hit 2 beam) A downward thrust, which causes the Monado to reveal its beam blade. Like his forward and up smashes, the first hit from the Monado's blade is leads into the second hit from its beam blade. The second hit meteor smashes if the blade hitbox connects. A decent edge-guarding option, it can also stage spike edge-hanging opponents. However, it has high landing lag, making it punishable if missed. Like his up aerial, it has minimal horizontal range, each hit only lasts 2 frames, and its first hit might not connect into its second hit if Shulk is moving too fast. — Reaches out. Shulk's overall grab range is average. While Speed is active, however, his pivot grab becomes tied with Meta Knight's for the third longest in the game, thanks to his increased speed and decreased traction. 3% Hits the opponent with the Monado's pommel. A slow pummel, but while Buster is active, it is tied with Olimar's White Pikmin-based pummel as the most damaging pummel in the game. Conversely, it is the least damaging pummel in the game (in regard to dealing damage per second) while either Shield or Smash are active. 3% (hit 1), 8% (throw) An upward swipe. It lacks true follow-ups because of its base knockback, but it can lead into a dash attack or a forward aerial at low percentages with Speed or Buster active. It is also Shulk's second most damaging throw, with its base knockback allowing it to set up edge-guards. Although the slash can hit other nearby opponents, it deals set knockback on anyone aside from the thrown opponent. It is also capable of locking nearby floored opponents, a trait shared with all of Shulk's throws. 3% (hit 1), 9% (throw) Pulls the opponent behind himself and performs a reversed gripped thrust. Shulk's most damaging throw and one of the few moves in the game that has back-facing knockback, which allows it to be used as a set-up for a Back Slash. With Smash active, it is one of the strongest back throws in the game, as it KOs around 125%. However, its below-average knockback growth prevents it from KOing reliably while Smash is not active. 3% (hit 1), 4% (throw) Heaves the opponent in the air and performs a kneeling upward thrust. It has combo potential at low percentages and/or with Buster active, as it can lead into several up tilts or Air Slash with Buster active, or a ground attack if the opponent air dodges. With Jump active, it can lead into a forward aerial, although this requires the opponent to DI away. At high percentages, it can act as a set-up into an up aerial while Jump is active, which has the potential to KO opponents if their reaction is read properly. This combo is only avoidable with an air dodge and, due to Shulk's ability to buffer-cancel Arts or double jump to increase his jump height, this can be effectively performed at a wide range of percentages. This is referred to as the Monado Purge Combo. 3% (hit 1), 4% (throw) Pins the opponent to the ground and performs a kneeling downward thrust. It has varied utility depending on Shulk's active Monado Art. With Buster active, it can combo into dash attack, forward tilt, forward smash, or forward aerial beginning at 0%, with the combo into forward smash being capable of dealing 35%. With Smash Active, it is notably the strongest down throw in the game, capable of KOing at around 120%. With no Arts active or any Art active aside from the above listed, it lacks combo or KO potential because of its base knockback and its throw hitbox's very low damage output. Default Monado Arts — Activates one of five Monado-based Arts: Jump, Speed, Shield, Buster, or Smash. Each Art enhances particular attributes at the cost of hindering others, and lasts for 16 seconds unless manually canceled. Each Art also has cooldown, during which they cannot be used until 10 seconds pass. Shulk poses and announces an Art's name if it activates when he is not attacking or dodging; this grants 14 frames of intangibility and can be used to replace landing lag animations or change directions in midair. This is pivotal for several Monado Art-based techniques, including his signature technique, the Monado Art Landing Lag Cancel. Shulk will yell out the name of the move the player chooses, and make a unique pose for each ability. Custom 1 Decisive Monado Arts — Each Art lasts for 21 seconds instead of 16. Their positive effects also receive a slightly stronger boost than with the default Monado Arts, but once an Art is activated, it cannot be canceled manually. Due to this, this prevents the effective usage of Monado Art-activated advanced techniques. There is also a slight delay before the Arts activate. Custom 2 Hyper Monado Arts — Each Arts' buffs and debuffs are both amplified, but the Arts only last for 5 seconds instead of 16. Each Art also has cooldown that lasts for 15 seconds instead of 10. Default Back Slash 10% (front/front landing blade), 9% (front/front landing tip), 16% (back blade), 14% (back blade tip), 15% (back landing blade), 13% (back landing tip) A leaping downward slash. Shulk takes a small leap forward upon start-up, giving it slightly more range and allows him to jump over small projectiles. However, it cannot grab edges once initiated, making it largely ineffective as a recovery move, and is a relatively slow attack, especially in regard to ending lag. True to its name, it deals more damage and has higher knockback if it hits the opponent's back. While near the edge of Final Destination, the blade hitbox KOs middleweights at 88%/79% (3DS/Wii U). Although it KOs opponents much later when hitting their front, it is still decently strong regardless, doing so at 146%/135% (3DS/Wii U). Yells “Backslash!” when using the move. Custom 1 Back Slash Leap 10%/8% (front), 16%/14% (back) Leaps much higher before performing the slash and has slightly faster start-up, but grants less horizontal movement. Custom 2 Back Slash Charge 4% (front), 13%/11% (back) Grants super armor for the slash and increased horizontal movement, but deals noticeably less damage if it does not strike the opponent's back. It also has significantly higher ending lag, making it much more punishable. Default Air Slash 6% (hit 1 clean), 5% (hit 1 late), 5.5% (hit 2) A jumping upward slash, similar to Dolphin Slash. It is a natural combo: its first hit has set knockback, while pressing the attack button at its conclusion will result in a second hit, which is an outward slash that grants a small vertical boost, especially if used late. Its second hit has extremely high knockback growth, which makes it a useful KOing option, especially from out of shield. While near the edge of Final Destination, its second hit KOs middleweights at 127%/118% (3DS/Wii U) versions, respectively. The Jump Art increases vertical distance gained by the first slash. However, its first hit will not automatically edge sweetspot unless the special button is pressed when Shulk is right next to an edge, and the Jump or Smash Arts can cause the natural combo to whiff due to the additional vertical distance and higher knockback, respectively. Yells “Air Slash!” when using the move. Custom 1 Advancing Air Slash 6% (hit 1 clean), 5% (hit 1 late), 8% (hit 2) The first slash launches opponents diagonally, while the second slash is faster and moves Shulk forward and slightly downward. The second hit is additionally stronger. Custom 2 Mighty Air Slash 9% (hit 1 clean), 7% (hit 1 late), 10% (hit 2) Deals more damage and sends opponents up vertically, but shortens the Monado's beam to the length of the blade itself, which makes both hits more difficult to chain together at high percents. Default Vision 1.3× (standard blade/beam; minimum 10%/7%), (alternate blade/beam; minimum 13%/10%) A counterattack involving Shulk using the Monado to foresee an attack. If he is hit, Shulk retaliates with a slow, powerful, and long-ranged slash that launches opponents forward. Alternatively, holding forward while counterattacking on the ground causes a fast dashing slash that deals more damage and knockback growth in addition to launching opponents backward, but at the cost of less range. It is one of the strongest counters in the series (with its alternate version rivaling Counter Surge in regard to power), and is tied with Double Team for having the longest amount of counter frames. However, it loses counter frames if repeatedly used over a short period of time, making it and Witch Time the only counterattacks that lose effectiveness if spammed. Counter frames are regained over time or once Shulk is KO'd. The standard counterattack resembles Stream Edge, one of Shulk's Physical Arts, whereas the alternate counterattack resembles Thunder, one of Dunban's Ether Arts. Custom 1 Dash Vision 1× (standard blade/beam; minimum 8%/5%), (alternate blade/beam; minimum 11%/8%) Takes a large step forward, increasing the counterattack's range. The counterattack is also faster, but has a lower damage multiplier. Custom 2 Power Vision 1.5× (standard blade/beam; minimum 17%/14%), (alternate blade/beam; minimum 20%/17%) The counterattack has a higher damage multiplier and deals more knockback. The alternate counterattack in particular boasts extreme power, as it can KO opponents on small stages even after countering something weak, such as a neutral attack. However, the counterattack is slower. Consecutive uses also drastically shorten its active frames, to the point where it cannot counterattack whatsoever after several consecutive uses. Chain Attack 3% (hit 1), 2% (hits 2-12), 12% (hit 13), 5% (hit 14) Traps opponents in a bright ball of light. If it hits, Shulk summons Dunban and Riki to perform a Chain Attack on the opponent, which he then concludes with a powerful slash. Chain Attack's damage output and knockback are also affected by Monado Arts. Even with no Arts active, it is among the strongest Final Smashes in the game, as it is strong enough to KO middleweights at 17% while near the edge of Final Destination in the 3DS version. However, it has a short range, as Shulk needs to be close to the opponent in order for its first hit to land. In addition, Arts can expire during the Chain Attack's cutscene, which affects its damage output and knockback. Up taunt: Shrugs, shakes his head, and waves a hand as if lecturing someone while saying "Now it's Shulk time!" (穏やかじゃないですね?, Not being gentle, huh?). The animation itself resembles the one Shulk performs when engaging in a conversation in Xenoblade Chronicles. The English phrase is a reference to Reyn, his best friend and one his party members, who utters the phrase "Now it's Reyn time!" whenever his Talent Art gauge is completely filled during combat. The Japanese phrase similarly references a popular phrase in Japan; in this case, a line Shulk commonly says when accepting quests. Side taunt: Grips the Monado's handle with his right hand while triumphantly pumping his left fist and announcing "I'm really feeling it!" (だんだん乗ってきたよ!, Gradually getting the hang of it!). This is one of the lines Shulk may announce in Xenoblade Chronicles when his tension level increases in combat. Down taunt: Grips the Monado with both hands, activates it and poses similarly to when he activates Buster while saying "This is the Monado's power!" (モナドの力よ!, The Monado's power! / The power of the Monado!). If timed correctly, it can dodge certain projectiles, such as Blaster, Hero's Bow, and Palutena Bow. This is one of the lines Shulk may announce when he activates the Monado's Talent Art in Xenoblade Chronicles. The second half of the riff of You Will Know Our Names, the theme used in Xenoblade Chronicles when the party fights a Unique Monster. The former English quote Shulk has a chance of exclaiming after finishing a battle in Xenoblade Chronicles, although it has also been changed from plural in that game to singular in SSB4, even in Team Battles, where it is his only line. Catalyst - Ranked 3rd on the New Brunswick Power Rankings and 35th on the Wi-Fi Warrior Rank. Contributes to Shulk's metagame. Darkwolf - The best Shulk player in Canada. Placed 13th at Get On My Level 2016 and has achieved numerous top placings at regionals, including 5th at Smash INTENSIFIES 2 and 9th at Nexus 2. Formerly ranked 6th on the Montreal Power Rankings. Erico - Placed 17th at Kings Of The North 4. Contributes to Shulk's metagame. FuerzaDON - The best Shulk player in Mexico. Placed 33rd at Smash Factor 5 and 6. He has wins over Chag, Regi, Cloudy, Klein, and Richi. Jerm - Contributes to Shulk's metagame. Formerly ranked 3rd on the Ottawa Power Rankings. Kome - One of the best Shulk players in the world. Placed 33rd at 2GGC: Civil War. He has wins over komorikiri, Shuton, and Tweek. Ranked 51st on the Panda Global Rankings v5. M - Placed 3rd at B.E.A.S.T 7. He has wins over iStudying and Glutonny. Masonomace - Contributes to Shulk's metagame. Nicko - The best Shulk player in North America, and one of the two best Shulk players in the world. Placed 17th at 2GGT: Mexico Saga, 65th at EVO 2016, 25th at 2GGT: Abadango Saga and 33rd at 2GGC: Civil War. Ranked 13th on the SoCal Power Rankings. Paradigm - Contributes to Shulk's metagame. Shuton - Placed 7th at 2GGC: Fire Emblem Saga and 8th at SwitchFest: I'm Really Feeling It. Has win over Ryuga. Ranked 27th on the Panda Global Rankings v4. Soronie - Placed 7th at Don't You Dair 3 and 49th at 2GGT: Abadango Saga. Formerly ranked 6th on the NorCal Power Rankings. Tremendo Dude - The best Shulk player in Florida. Placed 3rd at Glitch's low-tier event and 9th at Glitch 2's low-tier event. 9B - The first player to show mastery of Monado Art Landing Lag Cancel (MALLC) in a tournament. One of the first notable Shulk players before switching to Bayonetta. Artryuu - Placed 33rd at Get On My Level 2016, 25th at Nexus 2, and 4th at Back 2 School: Battle Royale. Formerly ranked 10th on the Ottawa Power Rankings. Masha - Placed 17th at Umebura 25, 13th at Karisuma 10, and 9th at Sumabato 14 before switching to Meta Knight. Opinions on Shulk's overall viability in the metagame have fluctuated greatly throughout SSB4's lifespan. During the game's initial release, Shulk was quickly discovered to be very flawed, mostly due to his moveset being burdened with very sluggish frame data, his aerials being incapable of autocanceling throughout their animations, and the fact that some moves (like his multi-hitting forward smash) didn't work properly or were simply undertuned. As a result, Shulk was poorly regarded early on. However, update 1.0.4 significantly buffed Shulk, which mainly addressed many of his aforementioned issues, alongside damage and knockback boosts to nearly all of his moves. When these buffs were coupled with the discovery of advanced techniques like his signature Monado Art Landing Lag Canceling (MALLC), Shulk's position on the tier list became a hot topic of debate among players due to his perceived potential, with some seeing him as a potential high tier once mastered. As time went on, players' opinions of Shulk dropped once again. Despite the benefits of his Monado Arts, Shulk failed to achieve high placings at major tournaments, so Shulk was perceived to be a low-tier character and was left with a small, albeit dedicated, playerbase as a result. Despite receiving some buffs in future updates, most notably update 1.1.3, they failed to compensate for his flaws. As such, Shulk was ranked 40th on the first tier list, placing him in the G tier and confirming his status as a low-tier character. Shulk's representation and results would then be largely stagnant for a time, largely because of his sluggish attacks being viewed as a significant issue and too inconsistent for high-level play. This resulted in him being ranked 44th on the second tier list, a slight drop from his previous ranking. Despite his low-tier status, Shulk's playerbase consistently discovered more Monado Art-based techniques that allowed his moveset and options to flow better than before. This, in turn, has allowed him to garner better results in recent times, with dedicated mains achieving top placings at a more consistent rate within their respective regions. Additionally, M, Nicko and Darkwolf have achieved notable placings at the national level, such as 3rd at B.E.A.S.T 7, 17th at 2GGT: Mexico Saga and 13th at Get On My Level 2016, respectively. These improved results have been reflected in Shulk being ranked 38th on the third tier list, placing him at the very end of the mid-tier. Despite his prominent weaknesses, some believe Shulk is still underrated in the current metagame, partly because of his obscurity and very steep learning curve. While debatable, some professionals like ZeRo nevertheless argued that Shulk should be ranked higher in the mid-tier. This argument has been supported by the performances of dedicated mains throughout early 2017, most notably Nicko and Kome each placing 33rd at 2GGC: Civil War, which was one of the most challenging tournaments in SSB4's lifespan. Currently, Shulk ranks at 35th on the fourth and current tier list, as a result of his slightly better placings. However, it is unknown how Shulk will fare in the long run, due to his relative obscurity in competitive play. In Xenoblade Chronicles, this young lad's colony is attacked by the Mechon, so he and his friends set off to take them down. In Smash Bros., his Monado Arts let him change his specialization during battle. You can choose to boost a stat—his jump or attack, for example—but other stats might drop as a result, so choose wisely. Shulk's up special Air Slash is an upward slash done during a jump. Press the button again quickly to launch opponents sideways. His side special Back Slash, on the other hand, is a downward swing with a very wide range, though using it leaves Shulk wide open. Try hitting foes from behind with this! In Xenoblade Chronicles, building up the party's team spirit would let them unleash a chain attack, using multiple Arts in a row to deal massive damage. In this game, Shulk's Final Smash calls party members Dunban and Riki to help obliterate an unlucky target... or multiple targets if you catch more than one in the circle of light! Mechanical Menace: Shulk must defeat a metal R.O.B., a metal Mega Man and Metal Face in a Stamina Battle. New Challengers 2: Shulk is one of the opponents fought in this event, alongside Greninja, Palutena, Robin, Dark Pit, Mega Man and Pac-Man. The Ultimate Swordsman: As Ike, the player must defeat Shulk, Link, Marth, Meta Knight, Toon Link, male Robin and female Robin. All of the opponents wield swords. Shulk's second through sixth alternate costumes correspond with one of his traveling companions in Xenoblade Chronicles, whereas his seventh alternate costume is based on his armorless attire in Xenoblade Chronicles. The Pic of the Day revealing Shulk's inclusion in SSB4. Using his forward smash on Sheik. Using his up smash on Captain Falcon while activating the Smash Art. Using Back Slash on Donkey Kong and Link. Using his down taunt alongside two Villagers using their down taunts. Using his forward aerial on Link. Using Chain Attack, his Final Smash. With Luigi on Boxing Ring. Shulk and Riki in Super Smash Bros. for Nintendo 3DS. On Smash Ball standby on Final Destination. Using his side taunt alongside Riki. The "extended neck" bone error during Shulk's down taunt, which only occurs with his armorless palette swap. The misaligned beam blade error, which occurs only on 2D stages. On Super Smash Bros. for Nintendo 3DS, Shulk's armorless alternate costume will cause part of his neck to stretch and connect with the Monado during his on-screen appearance and down taunt. However, this is not the case if the game is paused (via pausing or the "Hold L" option in Training Mode). Similarly, on the same frame as taking hitstun, the Monado's active Art symbol will flash in front of Shulk's neck. Both these graphical glitches are due to his neck sharing the same bone as the Monado's ring. If playing on any 2D stages on Super Smash Bros. for Nintendo 3DS, such as Flat Zone 2 or Super Mario Maker, the Monado's beam blade will not align properly during his victory pose in which he swings the Monado twice, his victory pose in which he wields the Monado in a reverse grip, and Chain Attack's final hit. He retains his jumping animation from Xenoblade Chronicles, while his dashing animation and one of his idle poses are almost identical to how they appeared in said game as well. When it is not in use, the Monado simply hangs from his back. This carryover makes Shulk the only sword-wielding character in the Super Smash Bros. series that does not hold their sword when not attacking with it. Ganondorf and his Sword of the Six Sages are exempt because of that sword's usage as a weapon only occurring as a custom move. Many of his voice clips are re-recorded versions of the lines that he would speak throughout Xenoblade Chronicles. His alternate blast KO line, "Not good!" (不味いね! ), is a reference to one of his battle lines from Xenoblade Chronicles, "Not good... I'm losing it...", which he mutters when his tension is at its lowest level in battle. This also makes Shulk one of the few characters to speak after being KO'd. Shulk is the only character to tumble towards the screen when another character footstool jumps on him, whereas other characters would tumble towards the direction they were facing. He is also the only character to hit the screen with his back during a screen KO. These animations make the Monado and its active Art more visible to the player. Shulk is the only human sword-wielding character that uses a "wobbling" sound effect while charging up smash attacks instead of the "unsheathing" sound that the rest of the sword-wielding characters use. Shulk and Palutena are the only characters who can interrupt one of their aerials during their ending frames. In Shulk's case, he can interrupt all of his aerials during their ending frames, which allows him to act out of them before he lands. One example is replacing a back aerial's 19 frames of landing lag by performing a neutral aerial before landing, decreasing its landing lag to 10 frames. The voice clip for Shulk's third victory pose, "I can change the future! ", is missing from the Sound Test. Despite not being a third-party character, Shulk is placed alongside them in most official material, including the Super Smash Bros. for Nintendo 3DS roster and foldout. In the Super Smash Bros. for Wii U roster, Shulk is placed before the clones, whereas its manual has him placed before Bowser Jr. As a result of this placement, Shulk may be mistaken as a third-party character. Due to Nintendo's acquisition of Monolith Soft in 2007 prior to the development of Xenoblade Chronicles, however, Shulk is not a third-party character. This page was last edited on April 12, 2019, at 12:48.